You can instantly search and stream movies, or you can reserve a preferred movie at a local kiosk with the Redbox Instant by Verizon iPhone, iPod Touch, and iPad app. The Redbox Instant by Verizon iPad app requires an existing account created through a search engine to get started. If you do not already have an existing account, you will want to open Safari or your preferred search engine to set up an account. An improvement in an update for this app would be the ability to create an account through the RedBox Instant by Verizon iPhone, iPod Touch, and iPad app. 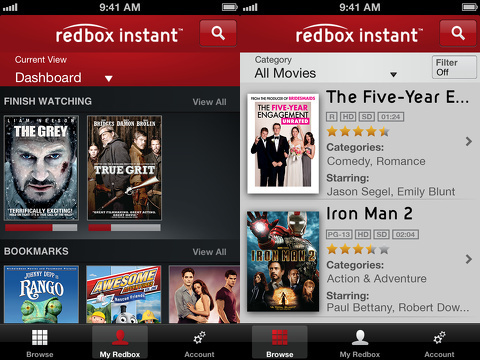 The interface of the Redbox Instant by Verizon iPad app is well-organized and intuitive. The home screen has a search icon in the top right corner of the menu bar. Just below the menu bar, photos of movies’ posters scroll across the screen. There is a menu bar at the bottom of the screen to move with one touch between home, browse, my Redbox, locations, and account. The rest of the screen is a matrix of movie posters with one touch filters to sort by subscription or kiosk. It’s like going to an old school video store on your iPad. You touch a movie poster, and you move to a new screen. You can watch the movie’s trailer with a touch on the preview icon in the top left corner. You can add a movie to your cue by touching the bookmark with plus icon in the top right corner. There are movie details like name, rating information, actors, director, and a synopsis. If a movie is available to stream, you touch the subscribe icon to start it instantly. If a movie is available at a kiosk, you touch the kiosk icon, authorize location services, and select dvd or blu-ray to reserve a movie at a kiosk. Additionally, you can add reviews for a movie. You can literally start a movie in three touches on your iPad screen–open the Redbox Instant iPad app, touch a movie, and press subscription. The quality of the movie is fantastic, and the ease to search, select, reserve, and play is amazing. From the home screen, you can access some neat features by touching the my Redbox and Locations icons. There are two ways to navigate my Redbox. There is a menu bar at the top of the screen to sort with one touch, or you can scroll with vertical finger swipes. There are reminders to help you stay on top of what kiosk videos need to be watched and deadlines. You can also access movies that you need to finish watching and bookmarked movies in your cue. To search for movies by kiosk location, you can select a map or list view. You can also monitor your Redbox Instant account information from the settings icon as well. The Redbox Instant by Verizon iOS app is a free universal download. If you do not have an existing account, there is currently a one month free trial to take a test drive. The monthly charge is $8 after 30 days. Promotions by Redbox Instant may change, so these fees may not be what you find. 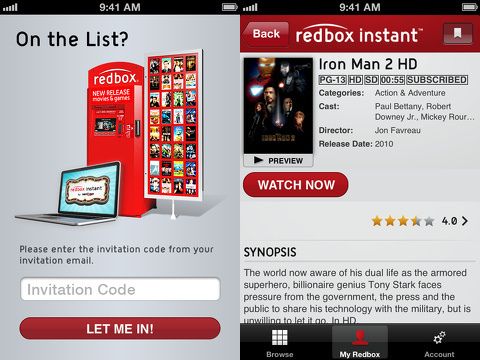 The Redbox Instant by Verizon iPhone, iPod Touch, and iPad app is simple, effective, and intuitive. If you’re new to Redbox Instant, you may be willing to handle the hassle of closing the app to create an account in Safari to save yourself a trip in the pouring rain to grab a movie. AppSafari review of Redbox Instant by Verizon – Movie and Video Streaming was written by Jenni Ward on March 18th, 2013 and categorized under App Store, Free, iPad apps, Movies, Universal. Page viewed 5360 times, 1 so far today. Need help on using these apps? Please read the Help Page.